Comprehensive release management that delivers the correct versions, on time. Release management is all about delivering the correct versions of the correct configuration items to the correct place at the correct time. It is a major business benefit – without it releases can go out the door with uncertain content, bug fixes get lost, ISO 9000 compliance is impossible and developers waste valuable time and resource. AllChange’s powerful baselining facilities enable a configuration to be captured, locked against any further change and released, removing the uncertainty about what is to be or what has been included in a release. The configuration can be captured in terms of the changes to be released. Moreover, the process of calculating which versions of which configuration items this requires is automatically performed for you. 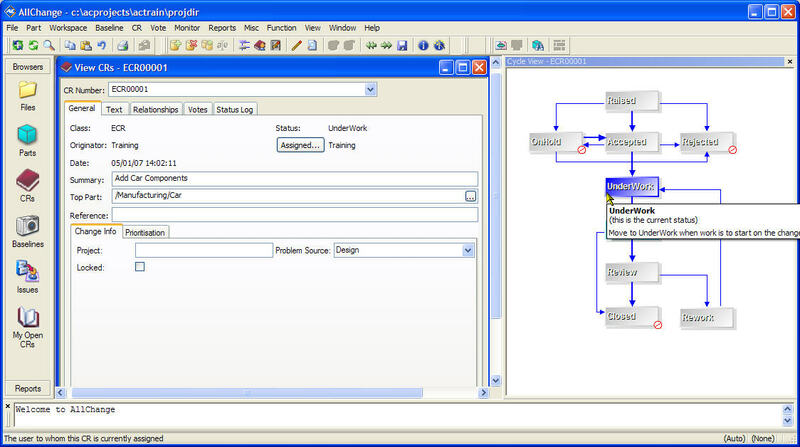 Full automation of the release process can be achieved using the process definition facilities. Full integration with the change and configuration item management allows AllChange to automatically build relationships between the baselines, changes and configuration items, which automatically reflects ‘state’ change information as the release progresses. Even when there is that last minute change, AllChange gives you the assurance that you can add or remove a change and rebuild the system without the risk of omitting any facet of the change. 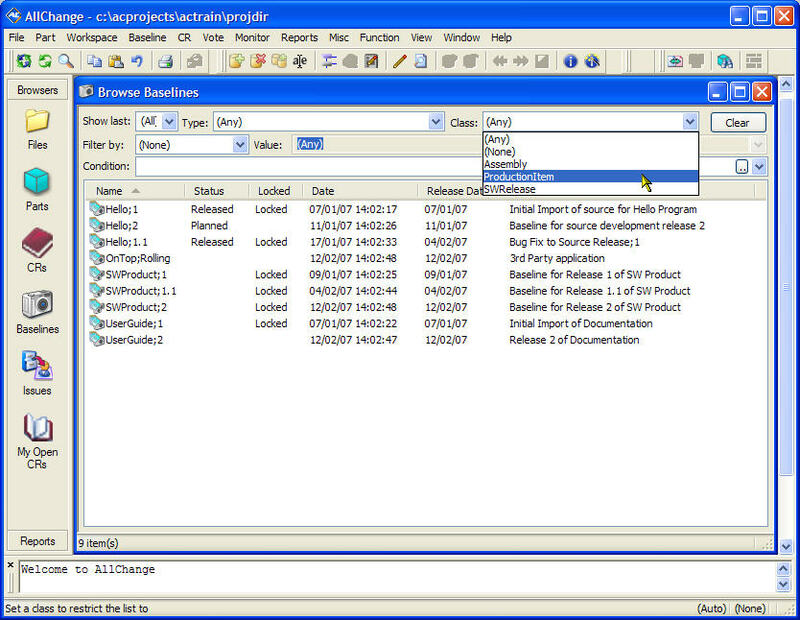 The baseline browser gives detailed information about the changes and versions that are released in a baseline. 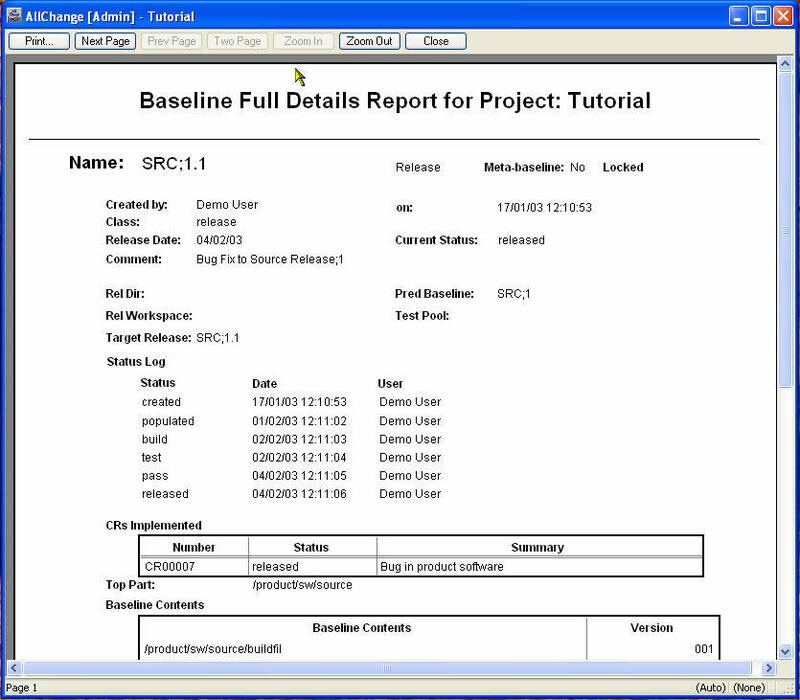 The report wizard makes it easy to produce detailed or summary reports on baselines, in a variety of formats. Using the integration with Araxis Merge, you can compare differences between files to see exactly what has changed. Process is there whether we like it or not and how we manage it is fundamental to business progress, or stagnation. The key to managing process lies in ensuring that your processes are supported by the tools you use and that they can be changed to reflect changing business needs. AllChange ensures successful process management by supporting the customization of the out-of-the-box processes and definition of new ones. Processes are defined as a sequence of states with conditions enforcing the process, and actions automating the process. 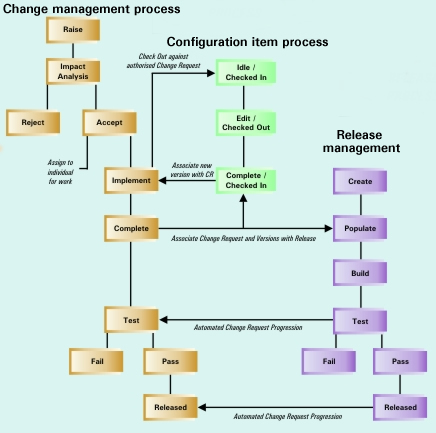 AllChange supports the integration of the different processes that are involved in change: the process for changing a configuration item, the process for controlling what changes are made and the process of releasing a set of changes. This ensures the greatest level of automation and transparency of the processes leading to efficient and effective execution of the processes defined. Change and release processes which can be enforced without imposing unacceptable overheads. The cycle viewer gives a simple graphical view of all the stages defined in your process. It ensures that your processes cannot be bypassed and that users follow them correctly. The process based system that does it all. 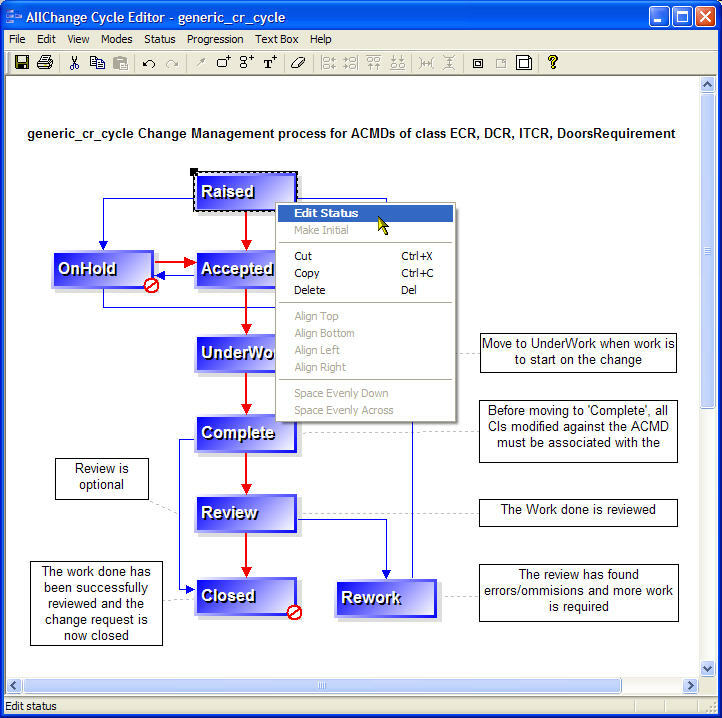 AllChange provides an active support environment throughout the lifecycle. From design and development, through process control and change management, onto release management and quality and configuration auditing. Ensuring that your procedures are carried out according to your specification. Tracking the progress of change. Securing components of a product against unauthorized access. Allowing your staff to work together but without getting in each other’s way. Making the correct information available, when and where you need it. One example out of an infinite number of processes available from AllChange.